CHARLESTON, SC (WCSC) - Citadel cadets in e Regimental Band & Pipes and Summerall Guards held their final dress rehearsal Friday. They are practicing for their parade performance in the presidential inauguration that is only one week away. This may be the seventh time that they have participated in a presidential inauguration at our nation's capital, but this year they are debuting a new role that is making school history. 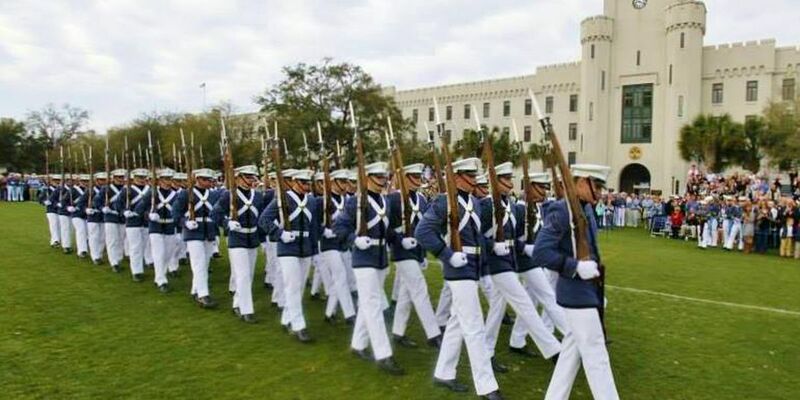 Citadel cadet Hunter Crawley is the first ever female drum major in the Citadel's 175-year history. She leads the Regimental Band and Pipes. "It's amazing, for lack of better words. It's a dream that I've actually had," Crawley said. "It's nice to be here and make history like that." Crawley may only be a sophomore, but she is no stranger to military standards. "My progression really started in high school with Air Force Jr. ROTC," Crawley explained. "I proceeded [to the Citadel]. I'm a pre-med major here. I'd like to go to med school and commission with the Air Force as a physician there." Lieutenant Colonel Keith Brace knows firsthand how beneficial the Citadel can be. "This place got me started in my military career," Brace said. "We have got some great men and women here that are going to graduate and go off and be leaders in our country. For them to be able to participate on a national stage, really an international stage, and showcase what the Citadel produces, the quality men and women that we put out from this institution, it's a great opportunity." For Crawley and the other 150 cadets heading to our nation's capital next week, performing at president-elect Donald Trump's inauguration is a once-in-a-lifetime opportunity. "They realize just how historic it is to be able to participate in such an event like this and it's a great opportunity for them to represent their organization, represent their school and represent their nation," Brace said. "This will be my first, big performance so, for me, it was definitely exciting," Crawley added. "It's just a huge honor to be able to go up to D.C. and represent the Citadel. " Their performance will be next Friday, January 20th, in the presidential inauguration parade for the United States' 45th president in Washington D.C. You will be able to live stream it online on the Citadel's Facebook page. You can also visit that page to see footage from today's final dress rehearsal.